Good afternoon, Bonjour, Aaniin Boozhoo, Wacheya. I want to thank David Wojcik and the team from the Mississauga Board of Trade for providing me with the opportunity to be here today to address Mississauga’s business community. I want to start off by introducing our new Council for the 2018-2022 term. You would be hard pressed to find a more dedicated and hard-working team of Councillors anywhere in the world. We also have former Mayor and Chancellor of Sheridan College, Hazel McCallion joining us today. I’d also like to acknowledge that we have several MPPs from the provincial government joining us here today. Now, I’d like to introduce you to what leadership looks like at the City of Mississauga. Nothing we achieve would be possible without the support of our dedicated, professional, and passionate team of staff who are committed to excellence and to serving our residents and local businesses. I’d like to recognize our City Manager, Janice Baker and her team of Commissioners who keep our city running so well. I’d also like to acknowledge we have our Director of Economic Development, Bonnie Brown joining us today and acknowledge the work of her team on behalf of the Mississauga business community. Throughout my address today, you will see several stunning photos of our City’s skyline. I want to thank local photographer, Sanjin Avdičević, who is joining us today for perfectly capturing the beauty and essence of our City. Sanjin, please give us a wave. 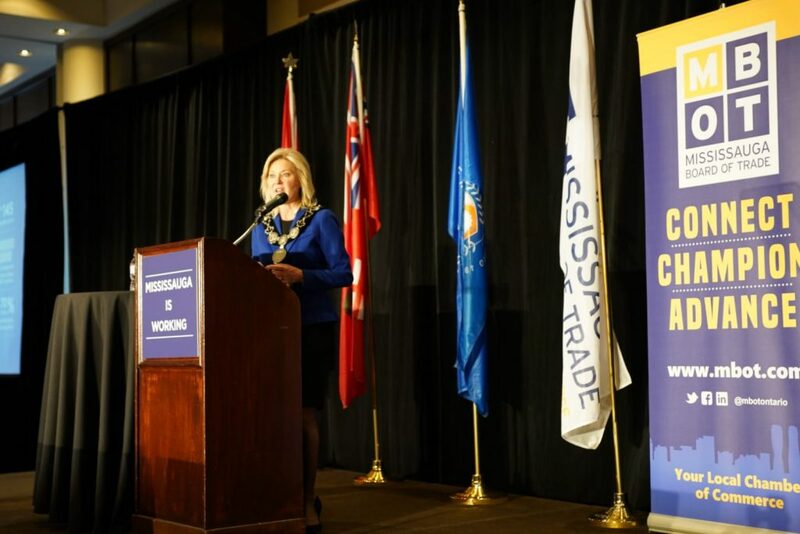 I’m proud to stand before you today to say the state of the City of Mississauga is strong. We are on the cusp of something big. We are a place where people choose to live and work and where businesses want to invest and innovate. The future of Mississauga is truly unlimited. Whether I’m meeting with the Prime Minister of Canada, the Premier of Ontario, the leader of the Federal Opposition, MPs, MPPs, travelling in the Middle East to talk to government and industry about water conservation and security or doing an interview with the Globe and Mail about the future opportunities and challenges of our growing city, one thing is clear. All eyes are on Mississauga. We are a magnetic city and our force is undeniable. We are attracting the best and brightest from around the world and have become a global commercial hub. Friends, Mississauga is open for business. Whether I’m in Osaka, Chile, Mumbai or New York, I hear it from envious Mayors, government leaders, and CEOs. Well, there isn’t just one. It is a confluence of factors. Our success is the result of a lot of hard work. The hard work of Council, staff and residents. It is founded on a commitment to fostering productive partnerships between industry and government. It is the institutional knowledge that understands our key sectors, how they are evolving and what they need to continue to grow and thrive. It is about being an ambassador and selling Mississauga at every single opportunity. It’s about lifting one another up so that everyone can share in Mississauga’s prosperity. When we move forward, we do it together. Make no mistake friends, Mississauga’s success is our success. It all starts with our greatest asset, our people. As the third largest City in Ontario and the sixth in Canada, we are proud to be home to one of the most diverse and highly skilled workforces in the world. Whether you were born here, have been here for thirty years, or are a new immigrant, Mississauga is a place where everyone can achieve success. Our people are our competitive edge, they help us rise above the competition. Other cities are hard pressed to compete. Mississauga is a city in demand. The world is changing at what can feel like a dizzying pace. We are more connected to technology than ever before. I’m guilty of too much screen time myself. Ideas, information, inspiration are being exchanged and money transferred in the blink of an eye or a click of a button. With three kids, I know a thing or two about the latter. The global tech boom is forcing companies to fundamentally change how they do business, and quickly, or risk being left behind. Supply chains are adjusting to respond to consumer expectations for real-time, same day delivery. Companies like Zebra Technologies in Mississauga, are helping organizations like Canada Post respond to these challenges by providing innovative solutions that are keeping up with the speed of business. Similarly, Hydrogenics a Mississauga based company that manufactures hydrogen generation technology and fuel cell systems is adapting to the realities of climate change and a changing global market place by developing technology that powers our world with zero emissions. Our City is proud to be partnering with Hydrogenics to develop a pilot that would allow transport trucks to reduce their emissions while contributing to the hydrogen fuel infrastructure in our City to power the next generation of vehicles. Keeping up with an ever-changing global economy presents itself with new challenges. All of which require new ways of thinking and new ways of doing business. As a City, we are evolving and changing for the better. We stand apart from other municipalities in our approach to business. And as a result, we are attracting the creative thinkers, innovators, influencers and entrepreneurs, who are helping us stay one step ahead of the competition. Mississauga is ready for whatever the future may hold. We are preparing for the jobs of tomorrow, not the jobs of today. With a rapidly shifting economy, the nature of workplaces and employment is also changing. The skills needed to succeed in the business world ten, or even five years ago for that matter, have changed. In order to stay competitive, we need to properly match business with talent. That means making sure that our post-secondary institutions, UTM and Sheridan College, are teaching students the skills they need to prepare and compete in the workplaces of the future. Along with academia, local businesses are also working on skills training themselves. Look no further than the tremendous work that Cognizant is doing at their campus here in Mississauga. We were proud to welcome this global tech leader to our City last year, where they have since created 600 highly skilled jobs. Cognizant has partnered with Seneca College to launch a free technology training program that will create jobs and expand access to qualified tech workers by helping new graduates transition into our growing ICT sector while ensuring that existing IT professionals have the skills they need to keep up in the ever-changing world of technology. When it comes to attracting and retaining highly skilled talent, Mississauga is always one step ahead of the competition. That is one of the reasons why we are outpacing the province in terms of job creation. Last year alone, the City of Mississauga was directly involved in the creation of up to 4,500 new jobs. Over the past four years, working with staff, we have attracted or help expand over 430 companies, creating over 11,500 new jobs. It has never been a better time to locate, start-up or expand your business in our City. I am proud to say that Mississauga is officially the business capital of Canada. That is right, we have the highest concentration of businesses per capita than any other city in Canada. We are also the second largest cluster of employment next to Toronto, and well outpacing other cities in the GTA. If you are looking for a job, you need not look further than Mississauga. We are a net importer of jobs, more people come to work in Mississauga each day than leave for employment in neighbouring cities. Whether you are a new immigrant, just finished school or are looking for a senior, executive level position, Mississauga offers a wide range of employment opportunities. When you hear me say “diversity is our strength,” I am not just talking about our people. I am talking about our business community. We are unique in that our companies are diversified in their verticals and in their client base. This helps insulate and stabilize our local economy in what can be a turbulent world where the winds of global politics are creating economic storms. This includes new trade agreements that can create opportunities for some industries by removing barriers, while limiting exports for others. Looking ahead, I am confident that Mississauga’s diversified business sector is prepared to weather any economic shocks or dips in the global economy. In fact, just last week I was in Washington where of course, I was selling Mississauga while talking trade at meetings with members of Congress and my American colleagues at the U.S. Conference of Mayors. As the representative of Canada’s Big City Mayors, I drove home the point to my American colleagues as well as to Members of Congress that free trade is not only important to our national and provincial economies but to our local economies as well. Until USMCA is ratified, I will continue to be a strong advocate for free and fair trade which creates jobs and prosperity on both sides of the border. As Mayors know, cities are on the frontlines of any trade agreement and the real impacts are felt here on the ground. As much as we need free trade, we also need to ensure that as a City, we remain a competitive business destination. That means running a tight and stable ship. Our staff have earned a reputation around the world for their leadership in financial management. On nearly every indicator, our financial condition has improved over the past four years. For the fifteenth straight year, we have received a Triple A credit rating, which gives businesses the confidence to invest in our City. Fiscal prudence, efficiencies and identifying cost savings are baked into our corporate DNA. We are working to keep money in your pocket and keep businesses competitive. We are a lean city and no, that doesn’t necessarily mean we skip the elevator and take the stairs every day. Through the LEAN methodology, staff are trained to find efficiencies and review processes that may be onerous or outdated which allows us to improve our service and program delivery and save you money. It has helped us become more business-friendly by streamlining our development application processes; saving you precious time. In 2016, we introduced E-Plans which allows development applications to be submitted online. A simple, but an important change. As you can imagine, this has been a game changer for our City and has improved our ability to better serve our businesses. Since we introduced this service online, we have processed over 19,000 applications and converted an impressive 93 percent of our users online. This saves you, and us, time and money while reducing our carbon footprint. Through LEAN, we have been able to do even more fine-tuning, which has resulted in pre-development applications being completed 43 percent faster than before, resulting in 150,000 dollars of cost avoidance a year. If you take a step back, the cumulative numbers are even more impressive. Over the past decade, we have saved taxpayers over 55 million dollars. And through this year’s budget, we are working to save you over 3 million dollars which ultimately helps us stay affordable, competitive and puts money back in your pocket. Our strategy is working and our efforts are paying off. We are being recognized with awards both at home and abroad. We have even become the poster child for savings for the province. When I met with him a month ago, he was quite impressed at the cost savings that Mississauga has achieved over the years and would like to see Ontario become the first-ever LEAN province. Now let’s talk about what the future will bring. In the next year and beyond, we must protect the progress we have made while growing our City responsibly. We will not cut our way to prosperity. We will not compromise the level of service we deliver to businesses and residents. We will plan and invest today to prepare ourselves for the challenges of tomorrow while continuing to create new jobs, attract investment and cement our position as a leader in Canada and beyond. As we usher in 2019, Mississauga finds itself at a critical juncture. For the first time in a generation, we have the distinct opportunity to define ourselves as a mature and independent city. An opportunity to stand on our own and grow on our own terms. An opportunity to position ourselves as a leading force in the GTA and beyond. With a population approaching 800,000, it is time for Mississauga to control our destiny. Much like other large cities in Ontario do including Ottawa, Hamilton, Barrie, Guelph, Sudbury, Thunder Bay, Windsor and London. It is time for our hard-earned taxpayer dollars to go strictly towards Mississauga priorities, not to pay for growth in other cities. The opportunity before us is one that Council and staff do not take lightly. In the months to come, we encourage you to get engaged, get involved and have your say on the future of Mississauga. While we do not know what exactly the future holds for us, I want you to know that as your Mayor, I will always act in the best interests of Mississauga. As a City, we will also need to handle the explosive growth we will experience in the next twenty years, when we will have nearly 900,000 people living in our City. We need to push ourselves to unlock our true potential. We are investing today to prepare Mississauga for the next generation of businesses. A city that is progressive, innovative, sustainable and affordable. A place where your children and grandchildren can go to school, get a degree, a good paying job and afford to live and raise their families for generations to come. In the next decade, downtown Mississauga will become a booming metropolis, a hub of activity, business, culture and innovation. It will quickly become the envy of the GTA and the model which other cities will seek to replicate. The investments we are making in our creative industry and film strategy will make Mississauga a hip, happening place that is “on fire,” a city that attracts, not bleeds talent. Our downtown will be a place where you can meet friends, study, work, go to a concert, take in a festival, get groceries, enjoy a meal, shop and connect via transit to destinations across the GTA. You have heard me say this before when someone says they are “going downtown,” they will mean downtown Mississauga. We are laying the groundwork for this vision today. Construction has already begun to prepare for the 25 new buildings, twelve million potential square feet of new office space and the Hurontario Light Rail Transit, or “LRT” as it’s known, which will form the north-south spine of our transit system, helping connect tens of thousands of people a day to prosperity. Over 3,800 businesses and 78,000 jobs rely on this line today. By 2041, those numbers will grow to one-quarter of all employment in Mississauga or nearly 130,000 jobs. Simply put, the LRT is vital to our economic success. Well, in addition to getting shovels in the ground on the LRT, we will continue to get people moving, fast and efficiently, by adding 31,000 additional hours of MiWay service this year, bringing the total the last 5 years to over 190,000 hours of new service. This is what the future of transit looks like in Mississauga. Advocating for all-day, two-way GO Train service, especially on the Milton line, improving our bus routes, better managing traffic signals and building more bike paths and trails will also be a priority. To the south along the waterfront where we are transforming a decommissioned power plant and oil refinery into livable, walkable communities that will connect the lakeshore from east to west and attract a new generation to Mississauga. These complete communities will serve as hubs for innovation, culture and tourism, putting our waterfront and our City on the international map. Few other cities in the world are developing 250 acres on their waterfront into cutting-edge, complete communities. The potential of these developments is enormous. And while there is certainly a lot of opportunities on our horizon, we cannot ignore some of the real challenges before us. Like any big city stepping up on the international stage, we will have to overcome some hurdles. We recognize that affordability, more specifically housing prices and the cost of living, are key to attracting new businesses and building a healthy, prosperous city. We don’t want to lengthen commute times for your employees or force them to live in another city. Our Making Room for the Middle plan will build more housing for middle-class families and it is already working. Over the next year and beyond, we will continue to make progress on our plan to incentivize developers to build more affordable housing that works for our residents. Our vision for Mississauga is a City where people can afford to live and work and do so, comfortably. Precarious employment is rising, and wages aren’t keeping pace with the cost of living. It is as sad, as it is unacceptable, that 15 percent of our residents live in poverty. However, I know how generous our City’s business community truly is and I would like to thank you for all your support over the years for my city-wide food drive for the Mississauga Food Bank. Here is your fearless leader David taking my One Bag Challenge. Thanks for your continued support David and all of MBOT! This year, we reached a major milestone by not only meeting but exceeding our goals, bringing the total amount raised since I first started the food drive four years ago to 1 million dollars and 1 million pounds of food. In the year to come, we will be ramping up our efforts to engage our business community in the food drive and hope that you will get on board for my 2019 food drive which will be kicking off in the fall. We will continue to work together to ensure our City remains one of the best places to live in the world. A place where everyone can succeed and where no-one is left behind. In order to make this happen, we need predictable, consistent funding from all levels of government. We need a new deal for cities. One that allows us to develop new revenue tools other than the property tax so that we can make strategic investments in our future. We will continue to work with, not against, all levels of government, regardless of political stripes, to advance Mississauga’s interests and ensure we receive our fair share of investments. There are no roadblocks in our way. All roads to government lead through Mississauga. Securing these investments will allow us to continue to foster an innovation ecosystem so that Mississauga is not only a place where innovators can come up with the big ideas but where they can also bring them to life. We will continue to focus on strengthening our position on the “innovation corridor” while putting Mississauga on the map with our entrepreneurship and innovation study. And while we have many of the building blocks in place including the RIC Centre and the Xerox Research Centre of Canada to name but a few, there is still more to do. We will continue to ensure that jobs and innovation stay in Mississauga by being a strong voice and advocate for local business at Queen’s Park and Parliament Hill. For instance, when I heard from our Life Science’s sector that the proposed changes to the Patented Medicine Prices Review Board would drive R&D and innovation out of the country, limiting access to new medications for Canadians, I was the first to write a letter to the Minister of Health to voice our concerns. In Mississauga, we will always stand up for jobs and investment. As a city, we cannot sit back. We need to make sure the voices of our key sectors are heard and that we take action to make the most of the opportunities before us. As many of you know, a great idea remains just that unless properly resourced. That is why on May 1st, I will host the fifth annual Angel One Networking event to help connect new, innovative and emerging start-ups with accomplished investors. While the saying is true that innovation can happen anywhere, at any time, we need to enrich our innovation ecosystem so that Mississauga is not only a place where great ideas are born, but where discoveries can be advanced and fully commercialized. We will become known as a leader in disruptive innovation and technology, and that’s not necessarily a bad thing! Mississauga will continue to be known as a smart, sustainable city that not only embraces new technology but develops it. Look no further than our tech sector, which is the second largest cluster on the innovation corridor, home to over 700 businesses. That is more than Kitchener-Waterloo, Markham and Richmond Hill combined. This cluster includes some of the top 25 Multinational Tech Companies in Canada including Samsung, Ericsson, Oracle, and homegrown success, Point Click Care. Mississauga’s tech sector is being recognized at home and across the world. A recent study identified Toronto Region, including Mississauga, as the fastest growing tech hub in North America. This is not only exciting but presents significant opportunities for us to work with industry to continue to grow the sector. In the coming year and beyond, our dedicated Economic Development team will work closely with these companies to find out what they need to scale up and thrive in our City. At the same time, we will also be releasing the findings of our entrepreneurship and innovation study which will help further inform the development of our strategy moving forward. Friends, the state of our City has never been stronger. The work we are doing today is strengthening our foundations for the next fifty years and beyond. Like I said earlier, we are on the cusp on something big in Mississauga. We are in a state of transformation. We are innovating and preparing for the economies of the future. We are a magnetic city whose force is undeniable. And, we are moving at the speed of business. In Mississauga, we not only keep up with the competition, we stay ahead of the curve. We are a place where the world comes to work, businesses want to invest and where people come to succeed. Mississauga has a distinct identity, separate from any other city, that if jeopardized, we run the risk of losing. The twenty-first century is ours for the taking. Now is the time for Mississauga to take matters into our own hands and become the world-class city we are destined to be. In the last year alone, over 3,600 companies chose Mississauga to invest and grow because of our City’s bright and promising future. CBS Film and Television Studios, Cognizant, Glaxo Smith Kline, Bombardier, Hoffmann La Roche, Wayfair, Fluid Master, MHI Canada Aerospace and Campbell’s Canada to name but a few. Friends, the future is truly unlimited in Mississauga. In the next year and beyond, by working together, Council, City staff, businesses and residents, we will continue to grow and shape our City. No matter where you are in the world, people will know Mississauga by name. As we look at the year ahead and beyond, I know there is more to do and more to achieve. Know, that I will not let you down. I will continue to make attracting business to Mississauga, my business. I’m looking forward to what the next four years will bring. Council and staff are ready for the long road ahead and we hope you will stay around for the ride. Together, we will shift our City and our economy into high gear, helping Mississauga maintain its status as a driving force in North America. The great thing is that the best is yet to come.